I thought the 22nd February was an apt time to start this blog, as it’s the date where members of The World Association of Girl Guides and Girl Scouts (WAGGGS) celebrate Girl Guiding and Scouting and pledge to take action for the world. Being the Birth Geek and also an active Guide leader with Girlguiding UK, this seemed like the perfect day to start posting. Why? 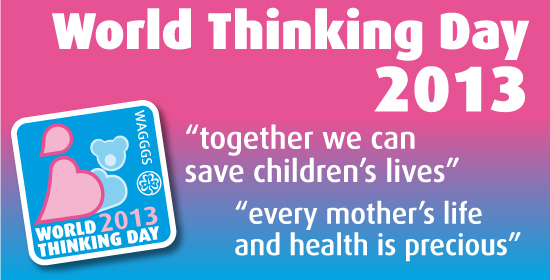 Well, this year’s theme for World Thinking Day is twofold: Reducing child mortality, and Improving maternal health. It makes perfect sense. As one of the largest international organisations for girls and young women, these issues will affect all of WAGGGS’s members and their communities around the world. In fact, with ten million members worldwide, WAGGGS is considered such a force for good that it has representation on the United Nations. Yep, you read that right. Your local Brownies and Guides are doing activities and projects to assist the UN. The topics of maternal health and reduced child mortality go hand in hand. Improve a mother’s health and ante/postnatal care and the chances of her children surviving are vastly increased. In fact, these two topics are part of the web of actions that form the Millennium Development Goals (MDGs): the UN’s vision for improving the world by 2015. To celebrate World Thinking Day, Brownies, Guides and Girl Scouts all over the world will have celebration events. As well as thinking about their guiding friends in other countries (and, if they are anything like my Guides, eating lots of chocolate), they will also take part in activities to learn about the focus MDGs. For example. at our local World Thinking Day party, the 5-7 year olds played a game where they covered their hands in glitter and shook hands with as many people as possible. The glitter represented germs to show how easily disease could spread. They they had to time how long it would take to wash all the glitter off with soap and water, and had a chat about the importance of washing your hands and what might happen if you lived in a country where there wasn’t great sanitation. Brilliant. Fun, memorable, and you get to run round with glitter whilst learning about international issues. What’s not to like? If you would like to see the kind of activities girls and young women around the world will be trying as part of this year’s World Thinking Day, the resource packs can be found here: http://www.worldthinkingday.org/en/activities10/childmortality/activities (Child Mortality pack) and here: http://www.worldthinkingday.org/en/resources/document/view/23630 (Maternal health). Changing the world: so simple, a five year-old can do it. Inspired to join in? Please let me know which activity you tried from the pack and what you learned from it in the comments below!